As the year winds to a close, I am trying to decide if I want to join any sock clubs or yarn clubs for the upcoming year. I am torn. With the economy in such turmoil, it seems silly to commit a lot of money in advance towards something like this. Then again, if people don’t support their little indie dyers and local shops, those business run the risk of going OUT of business and then where would we all be? Knitting Red Heart, that’s where. I’m just sayin. I joined a ginormous number of clubs last year, fueled by a windfall. 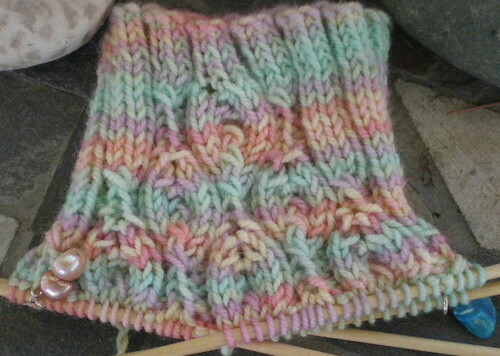 I’ve knit precisely one pair of socks (Ravelry link) and started another (see above) using club yarn. Mostly, it’s all just gone into my stash. I think I’m going to skip the prepaid yarn this year. They’ve been a lot of fun and I adore getting monthly packages in the mail that are stuffed full of fiber, but perhaps the better course is prudence and not mystery yarn. This year, if I have any left after tuition, I’ll take my yarn money and try to support my local yarn stores, like A Mano Yarn Center, a little bit more consistently. It seems like the neighborly thing to do, in times like these. It also makes me think how damn grateful I am to have the dilemma of “Do I join a yarn club.” rather than, “Do I pay the electric bill or do I eat?” Please don’t ever let me take that blessing for granted. This entry was posted in Family Life, knitting. Bookmark the permalink. 3 Responses to In the club. Well, I can sympathize with your sentiments. I’m going to keep on with Art Walk, b/c I can go month by month. I’m in the same situation, only fiber clubs. I stick with Spunky because I love it and because she charges by the month, not by the quarter. But I had to skip Hello Yarn AGAIN because $63 up front was just too much for me the day it was open. I figure I can scrimp on coffee and such for Spunky. I’m with ya there. That’s why I rarely buy yarn these days. What I don’t get given to me or swap for, I get from unravelling thrift store sweaters. The advantage of that is you can pick the best–there’s no way I could afford cashmere/angora/lambswool/silk/merino otherwise. The downside is that the garments are knitted at a fine gauge, which usually means doubling (or tripling) the yarn. Like you say, when I’m tempted to whine I try to remember there are many people in the world who would LOVE to have my problems.